A New York Times Bestseller " Chasing the Scream is a riveting book." -- San Francisco Chronicle It is now one hundred years since drugs were first banned in the United States. On the eve of this centenary, journalist Johann Hari set off on an epic three-year, thirtythousand- mile journey into the war on drugs. What he found is that more and more people all over the world have begun to recognize three startling truths: drugs are not what we think they are, addiction is not what we think it is, and the drug war has very different motives to the ones we have seen on our TV screens for so long. In Chasing the Scream , Hari reveals his discoveries entirely through the stories of people across the world whose lives have been transformed by this war. They range from a transsexual crack dealer in Brooklyn searching for her mother to a teenage hitman in Mexico searching for a way out. It begins with Hari's discovery that at the birth of the drug war, Billie Holiday was stalked and killed by the man who launched this crusade--and it ends with the story of a brave doctor who has led his country to decriminalize every drug, from cannabis to crack, with remarkable results. 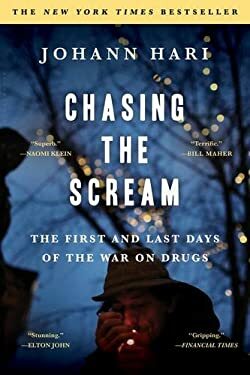 Chasing the Scream lays bare what we really have been chasing in our century of drug war--in our hunger for drugs, and in our attempt to destroy them. This book will challenge and change how you think about one of the most controversial--and consequential--questions of our time. New (239 available) BRAND NEW. Over 1.5 million happy customers. 100% money-back guarantee. Make your purchase count: support Better World Books' worldwide literacy partners.